The twisted hilt claymore represents the pinnacle of Scottish swords. Designed sometime around 1500, this style of Claymore was as attractive as it was deadly (and yes, that is a bit of a cliched statement: Apologies and what not). This one features a massive redwood twisted hilt that truly is beautiful to look at. The brass hardware of the pommel and cross sets off the redwood perfectly. 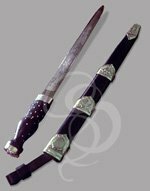 True to claymore form, the cross slopes downward toward the blade and ends in the standard honey-quatra flares. A spike of the hilt stabs downward into the ricasso to give the blade more strength. 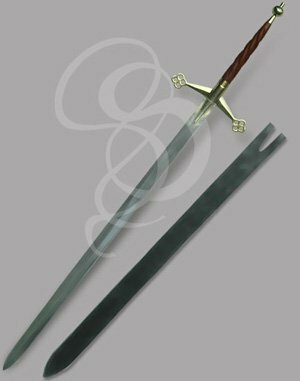 The sword is comfortable to hold and swing and looks great strapped onto a back. Included with the Claymore is a black leather back mount scabbard. The sword is shipped with an unsharpened blade. This sword is massive, beautiful, and durable. The steel blade is durable while still retaining an amount of flexibility. The brass compliments the redwood grip beautifully and really brings out the shine of the weapon. I have already taken this blade to a fight or two and it performs very well, even if it isn't under the "battle Ready" section of this site; this would make either a nice wall hanger or a LARP/HEMA weapon. My only complain it with the pommel, I love the design but it will quickly come loose, I believe this is due to the nut insert inside the pommel coming out, this can be fixed via Allen-wrench, but it is rather annoying; it should be a one piece pummel if you ask me. Overall awesome but and I look forward to another purchase with StrongBlade in the future! You folks don't play around when it comes to shipping and logistics!! Your company is fun, easy, and a great value. The sword is well made.